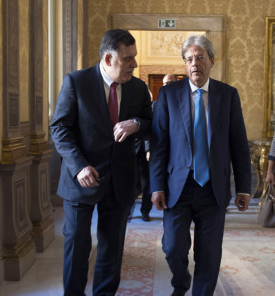 Presidency Council (PC) head Faiez Serraj has invited Italian warships to enter Libyan territorial waters to help battle migrant trafficking, the Italian Prime Minister Paulo Gentiloni said today. Serraj’s visit to Rome looks to be a sop to the Italian government after Gentiloni made clear his annoyance that French president Emmanuel Macron had seized the initiative by inviting Serraj and armed forces commander-in-chief Khalifa Hafter to Paris, where they agreed a ceasefire and early elections. This is the first time the internationally-recognised Libyan government has invited any foreign naval vessels into its waters to fight human trafficking. Two years ago, three Italian warships were accused of straying into Libyan territory off the eastern coast. Today Serraj and Gentiloni also talked about more help for the Libyan coastguard and with the patrolling of the southern borders. Gentiloni made a point of telling reporters he wanted to thank France for hosting the Paris talks between Hafter and Serraj. This is despite Italian fears that the new Macron government is seeking to propel Hafter into power and ditch the PC. A PC statement today said that Italy was interested in resuming flights to Libya and bringing Italian companies back to the country. No mention, at least officially, was made of the Italian consortium that is contracted to rebuild Tripoli International Airport. Also present in Rome today was PC foreign minister Mohamed Siala along with his Italian counterpart Angelino Alfano and Italy’s ambassador to Libya Guiseppe Perrone.